All Xperia Z devices are waterproof, but the new Sony Xperia Z3+ goes beyond surviving the elements, its touchscreen is happy to continue working even when wet. Capacitive touchscreens and water are like oil and, well, water – they don’t mix that well. You’ve probably seen the UI start jerk around when even a single raindrop lands on the screen. Not going to happen with the Xperia Z3+ though, Sony made sure of it. Most waterproof phones have hardware keys to get around this, but a few keys can only have limited functionality (typically reserved for taking a photo underwater). 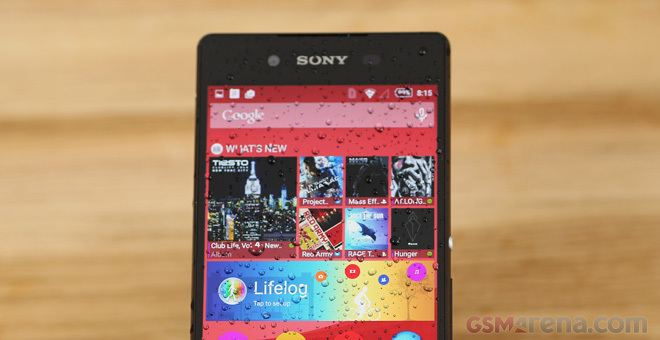 The Xperia Z3+ can be used straight out of the pool, without having to wipe the screen dry first. It doesn’t take long to see what’s happening. The Z3 screen registers multi-touch events, panning and zooming, or nothing at all. This makes it really frustrating to operate the UI since you’re never quite sure if your finger will press the button you’re aiming for or do something completely unexpected. We already have a preview of the Xperia Z3+ up online, and we’re planning on bringing you a full review next week. Let us know if there is some aspect you’d like us to test specifically.